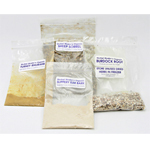 All natural Sea Minerals Bath salts ~ pure solar dehydrated seawater ~ An enchanting way to add precious trace minerals to your bath, while softening the water and gently cleansing your skin. The healing powers of natural sea salt can help relieve muscle aches and pains, ease stiffness and relax muscles. Seawater also has healing benefits to the skin. There are many benefits of a sea salt bath, and these baths are a great way to protect your health and improve your life without any medications or products filled with chemicals. You can make your own sea salt bath at home or visit a spa center where you can relax and improve your health at the same time.